You'll have to excuse me the legnth of this post. I was kinda having fun . . . I grew up in South Texas and although I didn't particular care for it (other than boasting in the good bbq and, well, nothing else immediately springs to mind!) I seem to have taken a bit of Texas with me when I left it. I suppose its inevitable. What is bred into you isn't likely going to be easy to get out. Not to say that I am bitter about my growing up years. Well. I am bitter about not having an accent. As far as my dislike for Texas is concerned, what it really boils down to is that I love the color green when it comes to grass, bushes and trees and South Texas isn't very accommodating in that respect. It favors the color brown. When I moved to Oregon I was delighted. My senses were OVERWHELMED with the lush vegetation, waterfalls, mountains, water, etc. I'm convinced that no other place on earth could be quite so beautiful (with the exception of Prince Edward Island, of course!). I picked up a copy of Cowboy Bunnies at our local Friends of the Library booksale a year ago. 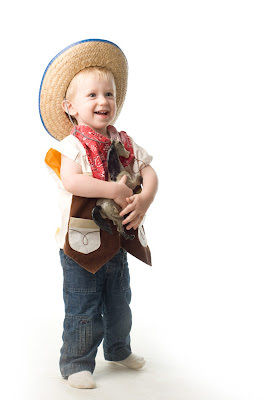 This story is told in rhyme and is a super cute look of cowboy bunnies out on the range. The illustrations all look as if they are painted onto old fence posts which is really unique. I think I probably like this book more than my son does, to be quite honest. Cowboy Bunnies . Check it out. Cowboy bunnies . 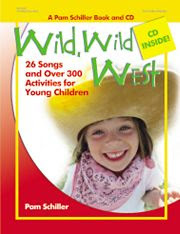 . .
Wild, Wild West: 27 Songs and Over 250 Activities for Young Children is my hands-down book of choice for the thematic units I plan on doing with my son when he's a bit older. For now, we're making really good use of the CD of songs which come with the book. For every song on the CD, there is a thematic study unit to go along with it. My son's current favorite is She'll Be Coming 'Round the Mountain (probably because we yell out "YEEHAW!"). He also comments at the tail end of "I'm a Texas Star" that "It's Texas fun!" (the last line in the song) refers to Nana and Papa. Nana and Papa, of course, being the Texas fun. I do not dispel this belief. He knows that Nana and Papa (and aunt, uncle and cousin) live in Texas and we'll go there - someday. When it's "cold." Like 75 degrees or something. At any rate, this book is really awesome, providing ideas for games to play, books to read, crafts to make and songs to sing. I love it, love it, love it! We're also really into puzzles and also, being in Oregon, we're surrounded by organic everything. Enter the Taraluna company with their non-toxic toys. They have some really fun stuff, nonetheleast of which are their wooden puzzles which are uniquely different. 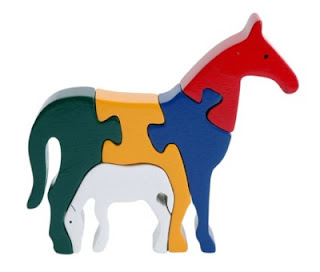 We tested their horse and foal puzzle and it find it highly attractive and well-made. They have a whole slew of animal puzzles which are worth taking a look at! I like the fact that there are just a few pieces in the horse and foal puzzle, keeping the puzzle from feeling overwhelming to a small child. Then there is the added benefit in having the pieces fit together to form an animal which beats the socks off of your more typical puzzle in our opinion. Lots of fun! The most important thing to note from this picture though is that he's holding a horse that my grandfather painted for me back when I was two (or really, really young). My grandfather raised horses in Oklahoma and I've had this horse as long as I can remember. I'm delighted to pass that piece of my past onto my son also. I'm also pleased to report that my son is a huge fan of BBQ sauce! I must be doing something right. So, what about you? 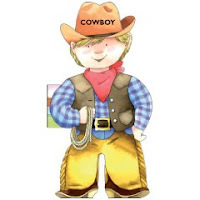 Any wild, wild west (or otherwise) memories that you pass onto your kids in the form of cutsy books and games? Do share! Are you sick of me saying that I always forget that you grew up in Texas? Actually now I remember. I love that picture (I meant of the flag and the bluebonnets, but the kid is cute too). Yum BBQ. And I don't really have an accent, do I? People in Portland always said that. People here either think that I don't have one, or that I'm totally Southern --- go figure. I am a New Englander at heart, even after living in MD now for almost 12 years, so I understand about how a place really never leaves you! Also, LOVE that horse and foal puzzle-- that was adorable! Hmmm...well normally I just pull a shot gun out and pepper anyone who dumps on my State, but in this case I'll make an exception. : ) Yes, I am a TEXAN and a die hard one at that. (I probably bleed BBQ sauce.) Speaking of BBQ sauce it is good your son likes it, but has he ever had real BBQ??? I'm skeptical. : ) And, as BBQ is about the only thing you like about my State your official Texas/country song is George Straight's "Texas Cookin' " here's the link I could only find a 20 second clip. http://www.youtube.com/watch?v=890nUC-ZyYA Enjoy! Books: Texas Mother Goose -This is a must have. Even if you are not in to Texas and just in to the West this book is well worth it you will NEVER look at Nursery Rhymes the same way again. Hank the Cowdog Series- Experience Texas through the eyes of a Cowdog. Sure to bring delight and BIG laughs to every member of your family. Horse stories: Marguerite Henry's are great; start with Misty of Chincteague. Toys: Breyer horses are extremely realistic toys or colectables (depending on which ones you buy)that come in small, medium, or large versions. Some are even based off of real life horses, like Misty. Great for play, lots of accessories can be purchased separately. Great Western toy??? Get them a set of cap guns!!!!!!!!!!!!! And let their imaginations take off! Cowboys and Indians...the West's version of army men. Thanks for all you shared Carrie and your comments; great stuff! ...Since our State motto is about Friendship I guess we won't rope and hog tie you if and when you make it back to the LONE STAR STATE! How about making peace over a plate of BBQ??? : ) Till next time Y'all! P.S. LOVE the pic of your son!!! P.P.S. The only people I KNOW who throw cow chips are from Oklahoma!!! : ) -I know you will understand! Tee Hee!